Previously Banoge North in MV. 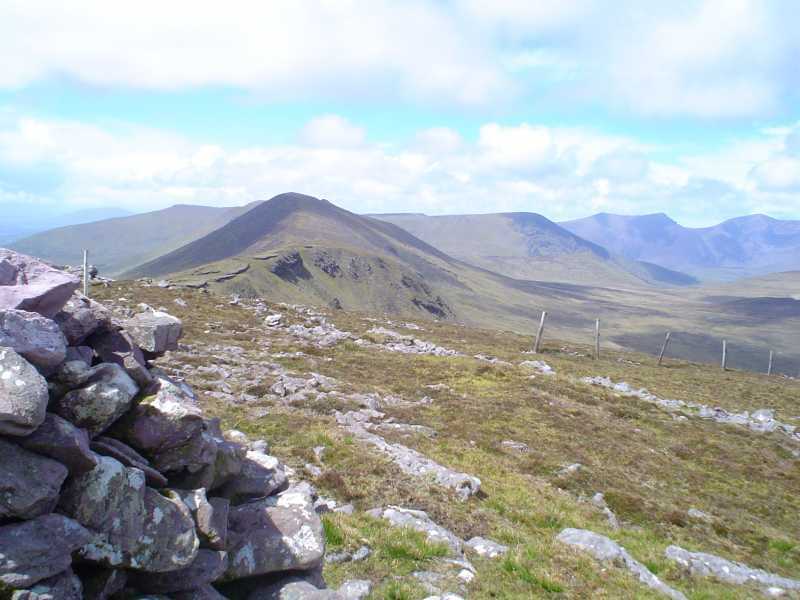 Cnoc na Bánóige is the 212th highest place in Ireland. Park in the large car park at the Connor pass. Cross the main road and head due east uphill following a distinct track for 200 meters, leave this track as it swings sharply south and continue uphill and east, skirting cliffs to your left side. You will come to a small semicircle of stones at about 620 mtrs elevation , pick up a low stone wall and follow it to the unmarked summit of Slieveanea about 400 meters to the east. From Slieveanea head south from the summit crossing rough bog for a little while before an easy ascent across a stoney surface to an Cnapan Mor , then descend to the Windy Gap and follow with a grassy sharp ascent to the summit.